This parasite cleanse is a 30-day regimen using several types of antihelminthics (anti-parasite/anti-worm medications). The key product for this cleanse is Wormwood Complex. Professor Kerry Bone of MediHerb developed this product on contract from an Australian company that wanted a naturally based lice shampoo. It was so successful that it became Australia's #1 lice shampoo. The active components, minus the shampoo, are effective for internal worms and parasites too. Call us at 608-242-0200 if you wish to discuss your parasite cleanse program or place an order for any Standard Process or MediHerb products. 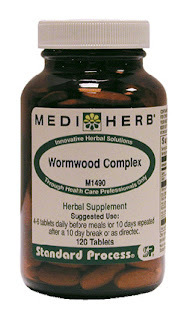 For the first 10 days, take 4-6 tablets per day of Wormwood Complex and 4 tablets per day of Andrographis Complex to boost immune system function. Optionally, also take 2 tablets per day of Vitanox away from the Wormwood Complex (at a different hour of the day). Vitanox is an antioxidant complex, but is also high in tannins, which will burst parasite eggs. For really stubborn cases, you can also add 3 tablets of garlic (5000 mg). For the next 10 days (days 11-20), take just the Andrographis Complex (4 tablets per day). For the final 10 days (days 21-30), repeat what you did for the first 10 days (see above). Basically what you're doing is creating a hostile environment for the worms and attacking their eggs for 10 days. During the break (days 11-20) you may get some more hatching and some of the tough guys may still be around, then you hit them for another 10 days. This is a safe treatment program and scientifically proven to work if worms are present. Once again, please call us at 608-242-0200 if you wish to discuss your parasite cleanse program or place an order for any Standard Process or MediHerb products.